EventLog Analyzer is an award-winning IT Compliance & Event Log Management Software for Security Information and Event Management (SIEM). Using this Log Analyzer software, organizations can automate the entire process of managing terabytes of machine generated logs by collecting, analyzing, searching, reporting, and archiving from one central location. This event log analyzer software helps to mitigate internal threats, conduct log forensics analysis, monitor privileged users and comply to different compliance regulatory bodies for PCI, SOX, HIPAA, FISMA, GLBA, etc.., by intelligently analyzing your logs and instantly generating a variety of reports like user activity reports, regulatory compliance reports, historical trend reports, and more. EventSentry is an affordable yet flexible real-time log, system and network monitoring suite. You can receive event log alerts through a variety of notifications (e.g. email, pager, etc.) and our filtering engine supports advanced features such as thresholds, day/time settings, summaries, timers, recurring schedules and more. EventSentry also helps companies meet the requirements of SOX, HIPAA, PCI and more through event log consolidation. With EventSentry you can consolidate events to a central database (many database type including Microsoft SQL Server and MySQL are supported) and create a variety of reports with the web-based reporting component. EventSentry uses reliable agents which monitor your machines without any impact on performance. Agents ensure that your systems are monitored in realtime regardless of network connectivity. Additionally, EventSentry also monitors services, disk space, performance, software/hardware, NTP and file checksums. EventSentry's compliance tracking feature normalizes Windows security events and provides insightful tracking information about Active Directory, application usage and logon activity. Network devices can be monitored through Syslog, SNMP and heartbeat checks. Lepide Event Log Manager provides a centralized platform to collect, consolidate and archive network-wide Windows event logs. It also allows you to collect and view W3C logs for all computers in the network. Software keeps track of all events in the network to generate timely alerts for critical events to ensure a safe and secure network environment. A number of reports can be generated for a single computer, specific group of computers or for entire network. You can create customized reports to extract specific information from the network computers' logs and also schedule reports for automated monitoring of the entire network. It offers a number of out-of-box compliance reports to meet Compliance requirements such as SOX, HIPAA, GLBA, PCI and FISMA. Get an edge over native tools to analyze all event details of entire network to improve overall system health and performance. LogMeister is a universal log reader with powerful monitoring and notification facilities. LogMeister captures data from disparate sources including text files, local and remote windows event logs and RSS feeds. It presents the results through a consistent, clear interface. You can employ filters to home in on a specific point of interest, or merge data from multiple logs to facilitate timeline analysis. In your absence, LogMeister will monitor incoming data and react to specific triggers by issuing alerts, running scripts and outputting new logs. You can export raw logs or transformed data to multiple formats such as text, csv, xml, html. This makes it possible to transfer data to other programs such as Excel, or into databases. You can even publish your logs as RSS feeds, and create floating satellite views that filter and sort log data independently of the main view. It harvests log data from computers across your network without the need for additional installations. Administrators and programmers can write scripts for LogMeister to run in response to criteria they have defined. eIQ’s SecureVue, a true Unified Situational Awareness solution can address these challenges. It provides an accurate, timely and coherent view of threat, risk and compliance. SecureVue delivers Unified Situational Awareness by combining Next Gen SIEM, Secure Configuration Audit, Compliance Automation and Contextual Forensic Analysis, through a single console yielding a unified view, operational efficiency and lower TCO. EventTracker is a reliable, proactive and practical enterprise class solution to centrally monitor, analyze and manage events being emitted by Windows NT/2K/XP/2003, UNIX systems and SNMP enabled devices. It empowers you with Event Consolidation, Correlation, Reporting & Monitoring from a central console. It will help in meeting audit requirements. It has powerful alerting and granular filtering. It also tracks system changes, applications, services, network connections and hardware changes. It archives events for multiple years in compress and protected format. It monitors application logs & text files. 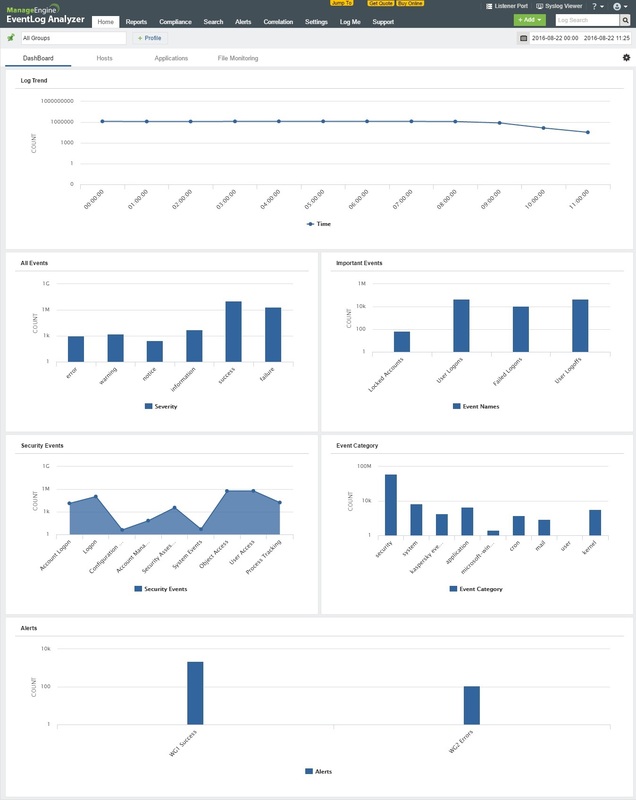 Configurable reports for detailed and management reporting - performance monitoring - critical service monitoring - interaction with other network manager - automatic backup and clear of event logs. Expert packet sniffer designed for packet decoding and network diagnosis, Colasoft Capsa monitors the network traffic transmitted over a local host and a local network, helping network administrators troubleshoot network problems. With the ability of real time packet capture and accurate data analysis, Colasoft Capsa makes your network transparent before you, letting you fix any network trouble.